The reason for people to change their explorers to Chrome is the official Chrome Google Voice extension, which was updated on last Friday. If you’re a Google Voice user you’ll probably make the change, too. The extension adds click to call functionality to web pages. So if there is a phone number on a web page, like a Yelp page or your online address book, it will now have a hyperlink. Click it and Google will throw you a pop up window asking which phone you want to use (home, mobile, work, etc.). It then calls that phone, and puts you through to the number. 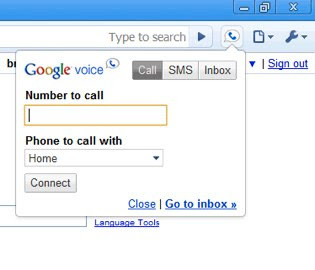 As the people asked web based click to call from the Google Voice team for months. Now we have it, all you have to do is use Chrome. The extension also adds a small box in the upper right of the browser. You can type in a name or phone number and call or sms it from the browser, and read recent text messages and transcribed voicemails (Google automatically transcribes voicemails, usually horribly, but it’s fun). The extension is buggy on Macs, and you need to use the most recent Chromium build, not the launched Chrome for Mac to use it. Download one of the recent builds for Mac. Google Voice doesn’t have an API, so third party applications need to harvest your user credentials to do anything useful with it. This Firefox add-on, for example, has nice click to call functionality but it requires that you give it your username and password. No thanks. One last thing – it likely won’t be too long before Google is adding soft phone functionality to the browser directly via their Gizmo5 acquisition. At that point you won’t even need a phone any more. You’ll just be able to initiate and receive calls directly to your computer as you can with Skype and other services today.